Over the last few weeks in this Fortification Series, I’ve discussed Dennis Hart Mahan’s teachings about field fortifications specific to the vertical plane – or specifically the fortification profile. As way of a refresher, the profile defined the heights and depths of the fortification to include the parapet, ditch, and glacis. Those terms and components in mind, let us go to the “field” to look at a real field fortification constructed during the Civil War. 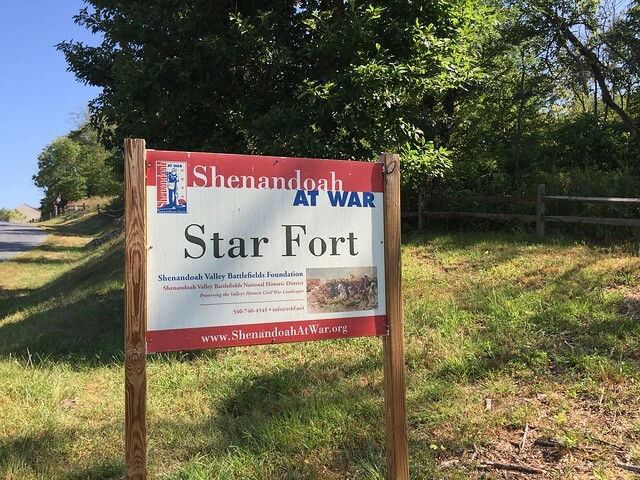 A handy example, for me at least, is Star Fort in Winchester, Virginia. We’ll get to the nature of these plans, looking at the fort on the horizontal plane, in later articles. Certainly want to discuss the particulars of star forts, salients, and the like. But for this installment, I’d like to focus on the fine points of the profile. Working backwards on Mahan’s diagram, we find that Star Fort had no glacis. Again, that component was optional. 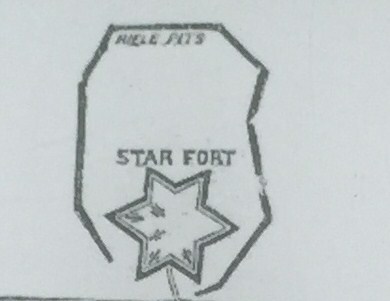 As Star Fort was built as an artillery platform covering open ground around Winchester, a ring of rifle pits around the fort was sufficient. Though the rife pits didn’t perform the function to elevate the line off the parapet, those pits did function to provide a line of resistance some distance off the main ditch. Star Fort does have a ditch and parapet. Imagine standing there with your musket, looking up at the muzzles of enemy muskets. not a good spot to be in. Trying to replicate the view of the defender at this point on the wall, my efforts were unsuccessful. Standing at the edge of mowed grass, and thus off the parapet itself, I held the camera up at arms length to overlook. Not a great view, but notice that we cannot see the ditch. Nope, only the ground in front of the crest of the counterscarp. If you examine this view – or at least while I was standing on the ground that day – the geometry is still very apparent, even for 150 years of erosion. 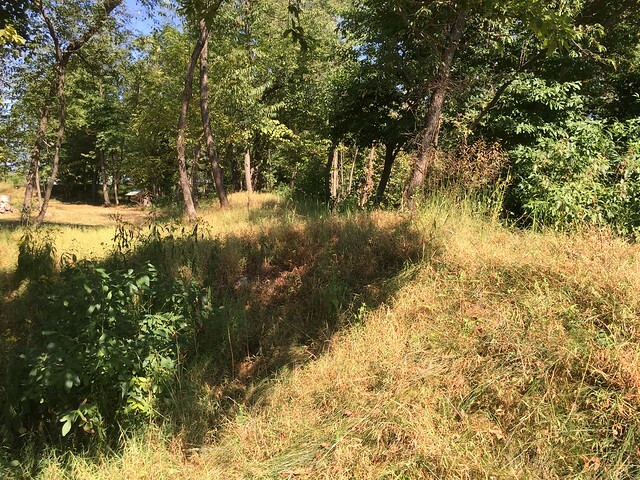 The angle of the superior slope of the parapet ensured the defenders could cover the crest of the counterscarp without being exposed to attackers. Here the visitor looks past the parapet and beyond the tree line to see the houses. Such demonstrates the ability of the fort to engage attacking targets within musket range. 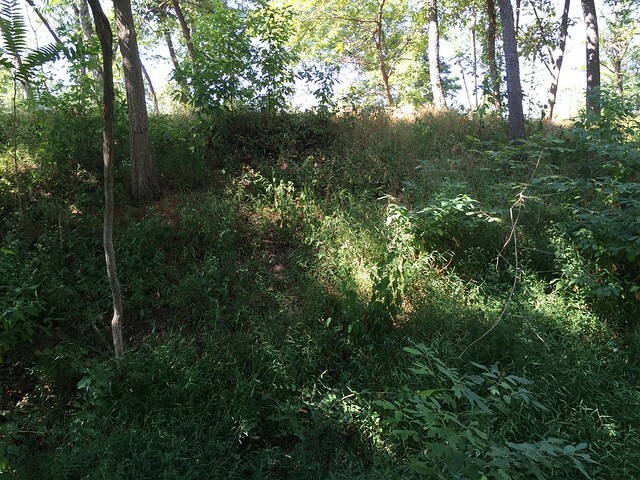 Anther point in the fort that demonstrates the geometry of the parapet is over to the south side of the earthwork. Today there is a trail cut through the works at a returning angle. I’m not versed well enough in the fort’s history to know if this was the sally port or just a modern cut. But the view serves well for our purposes here. Notice to the left there is part of the fort’s wall. The parapet has a saddle which appears to be a gun embrasure. I was holding the camera at about 6 ½ feet above the ground. And the location is at the crest of the counterscarp, or just outside the ditch. The attacker at this point could not see over the parapet on the left. In the center-right, where the wall is cut, we can see into the fort. Compare those two lines. Again the camera is about 6 ½ feet above the ground level, but in this case what would be the banquette. What is in view? The ground where I stood to take the first picture at this point of the line. Clearly Star Fort’s parapet was laid out with all the functional requirements espoused by Mahan. Closing, let me once again mention the importance of preservation of sites like Star Fort. This is a primary source for those studying the Civil War activity around Winchester. We are lucky to have such a well preserved example to reference. Let me take a break from Civil War topics here and shift back “four score and seven years” further back in time and 150 miles east (from Gettysburg). The place is Princeton, New Jersey. General George Washington lead the Continental Army to victory there on January 3, 1777. A victory for the Americans, it was a key point in the Revolutionary War. Not familiar with the battle? Let me direct you to the Campaign 1776 site for more details about the battle of Princeton. Why I bring it up? Well, Princeton is in the news this summer. On September 16, the Princeton Battlefield State Park officially grows by 4.6 acres, putting some important ground within the park boundary. Campaign 1776 helped facilitate this preservation project, in conjunction with the Princeton Battlefield Society and others. An early victory, if you will, in that worthy campaign. The article goes on to state, “The Princeton Battlefield Society plans to use National Park Service grants to conduct an archaeological investigation in cooperation with and supervision by the state Park Service.” So not only is this just adding more ground that you and I can walk over, this is ground that will be examined – properly examined – to help tease out more details on events that took place 238 some odd years ago. In other words, the preserved resources will further our understanding of history. 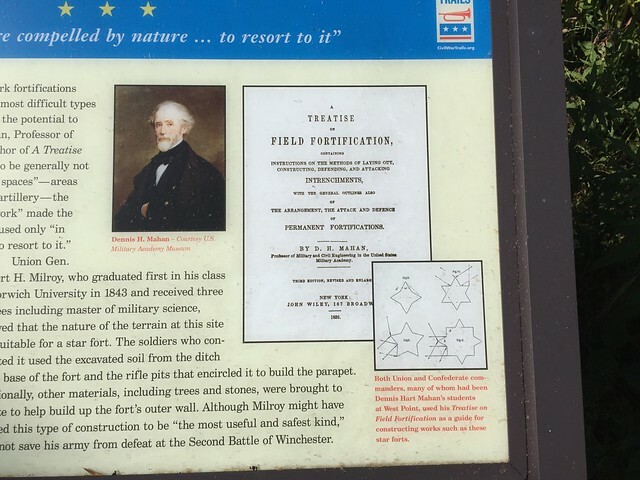 Not to downplay that positive note, but there are still portions of the battlefield at Princeton that are not preserved, can be preserved, and in need of attention. Another portion of the battlefield which has been in the news this summer is eyed for development. The Institute for Advanced Study owns property adjacent to the state park and has plans to build a set of townhouses. The ground is not simply near the battlefield, but actually the location of some significant fighting. 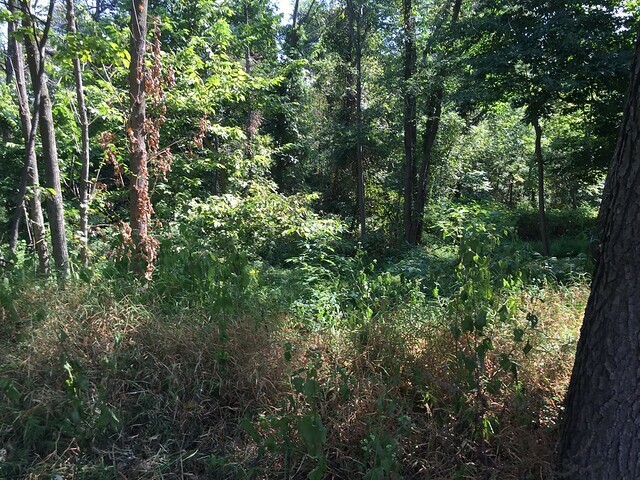 Indeed, 663 artifacts, 10 of which related to the action, were collected on the 7 acre tract. 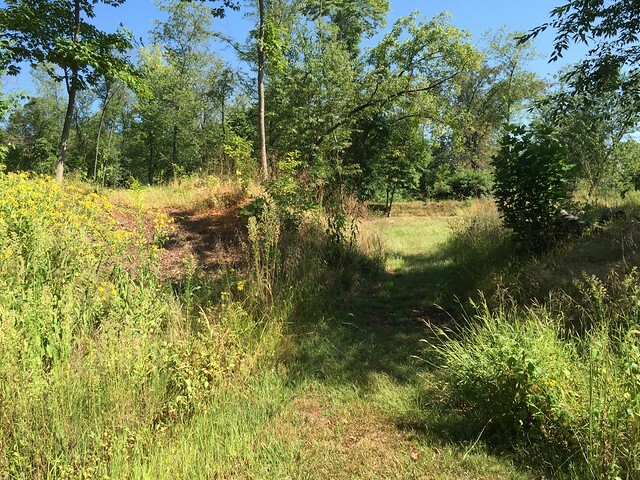 In July, the courts upheld a temporary injunction requested by the Princeton Battlefield Society to halt development. There was another hearing on September 3. But I have not seen any details on that. Now some will say as a counter to this that we have written accounts, maps, books, and over two centuries of study to help us understand the battle. Why do we need the land and those artifacts? Well I would respond that we simply don’t know what we don’t know. And what we do know is not enough. Now history tells us that on January 3, 1777, Washington’s command was an underdog. Chances of Washington winning a campaign, much less the rebellion, carried long odds. Yet, here we are. The story of what happened at Princeton, and earlier at Trenton, that winter are classical cases where a military commander turned the odds around. How those odds got turned around is the heart of the Princeton story. And precious details to that lay in the ground and with the land itself. Plotting where artifacts lay will in some cases shape the understanding of the battle lines – affirming what has already been written or introducing new data that might change those notions. Detailed study of the lay of the land offers insight into factors that faced the soldiers on that cold winter day. I’ve said it before, but it bears repeating – battlefield land is a primary resource. That’s why I champion preservation of battlefields from any era. These are strong statements indicative of the support the idea has received even with the public discussion at an early stage. For those of us who have carried, for many years, this idea for a Brandy Station and Ceder Mountain park these articles are music to our ears. 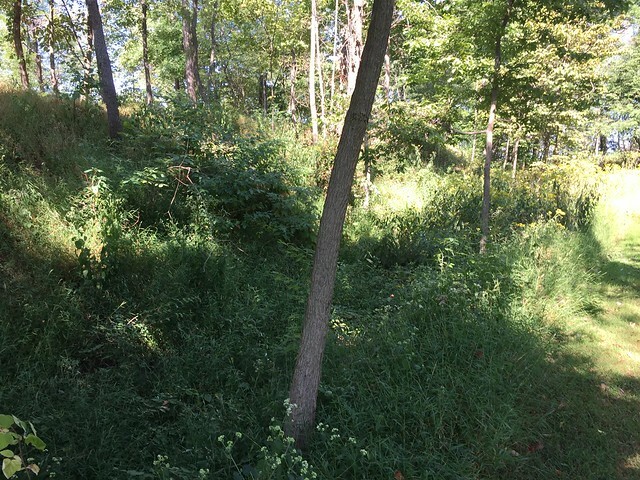 Earlier when blogging about having public discussions about a park, I had low expectations. But the response has exceeded those by yards if not miles. Furthermore, though I’ve been quiet about this on the blogging side, I find myself every day engaged on the “Culpeper Front” in ways large and small. When this park comes to be (and I don’t think it is an “if” at this point, but a “when”), we will once again see how public interpretation – specifically markers – have helped build interest, awareness, and support. Much as the comparison made to Resaca back in May. (And I would point out the release of the Brandy Station Battle App is a further advancement along that same avenue of approach but in a digital instead of physical format). Indeed, the Culpeper Battlefields Park, when it comes to fruition, will inherit a wealth of interpretive exhibits, most of which were written by experts on the battle and produced by the professional Virginia Civil War Trails and Civil War Trust teams. 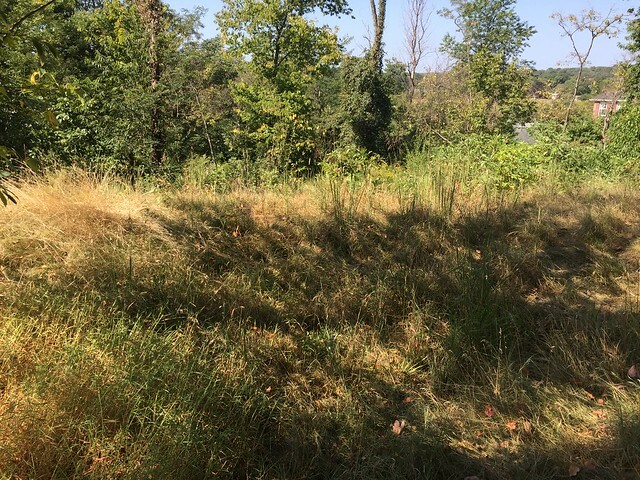 The current interpretive system (including the soon to be in place interpretation on Fleetwood Hill) will cover nearly every need the park might want. Well, save perhaps a few subjects – such as the USCT crossing at Kelly’s Ford at the start of the Overland Campaign and the passage of Sherman’s troops at the end of the war. It is a fine system that any park manager would boast of on the first day of operation. One physical element currently missing, of course, is a formal visitor center. There are some who have mentioned the use of the Graffiti House as a new park visitor center. That would be a mistake, in my opinion. The house is not in condition to support the foot traffic that will come into the park. It would need extensive, expensive structural work. Nor is it the place that visitors need to begin their visit (being on the wrong side of the tracks, literally). Furthermore, the real treasure of the Graffiti House is the surviving markings from the war which deserve preservation. Needed improvements to make a visitor center would detract from that preservation. Unless something akin to what was done for Blenheim in Fairfax – a visitor center separate from the historic structure – is completed, the graffiti would be at risk. And such a separate visitor center would essentially mean the Graffiti House would be an exhibit and not the visitor center proper. At that point, why place a visitor center in a place where visitors will need to traverse a busy highway in order to see what most are looking for? There are many places which could better serve as a temporary visitor center, assuming the state would prefer, as done at other battlefield parks, to build a purpose build visitor center with museum at some point in the future. Besides, we are getting way ahead of ourselves in planning where to park the buses. Some have alluded to the cost of running a new park as a negative in the park effort. Indeed the Virginia State Park system, as with many across the country, is at best “just” funded in terms of operations budget. The gracious offer by the Trust will allow some time for the state to work out the particulars to ensure the park is properly staffed and supported. Although there are a lot of details in the air and a lot of issues to be worked out, the notion of a Culpeper Battlefields Park has gained acceptance and picking up momentum. The reality of such a park is not far away! 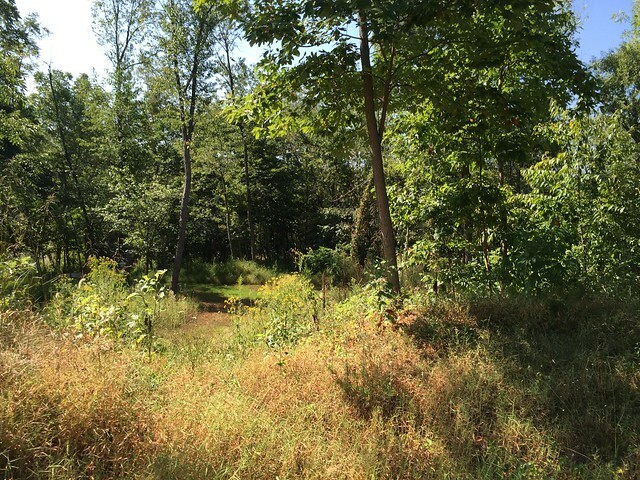 Sesquicentennial Observation: The last great surge for Civil War battlefield preservation… why? During the last four years, as I “walked and talked” the Civil War sesquicentennial, there were many observations which I rolled about at the pace of my footsteps. A post-sesquicentennial objective of mine is to fill some of those out and share here as blog posts. One of those is already up. 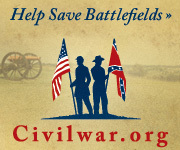 Today I’ll continue that thread with another observation “from the field,” if you will – we are experiencing the last great opportunity for Civil War battlefield preservation. 2/2 We have preserved more CW battlefield land here than the rest of the world COMBINED has preserved for all other wars in all of history. For the moment, let’s focus on the 2/2 part of that tweet conversation (we’ll circle back to the first part later). Americans have preserved MORE acres Civil War battlefield than any other nation has preserved for any other war in all of history. An impressive statistic. Civil War Trust lists 40,000 acres of battlefield among their accomplishments – preserved in whole or in part by that organization. Add to that federal (small “f” as in national, not the opposite of Confederate! ), state, and local parks on battlefields. And also mention lands preserved by other means, to include the initiative of the land owners. More land than for any other war in human history. Let that simmer at the fore. 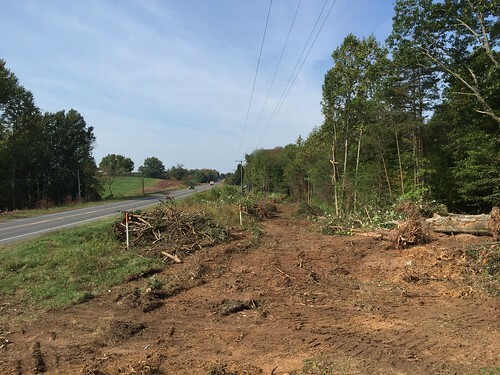 Let me offer my answer to that in “Craig Swain” fashion… as in starting with the “nuts and bolts.” The first part to consider is how – legally and administratively – all that land went onto the “preserved” side of the sheet. Preservation didn’t happen all at once. It took time and came in waves. The first great wave of preservation was by the generation which witnessed the Civil War, and driven by those veterans in the population. Timothy B. Smith called this the “Golden Age of Battlefield Preservation.” Very apt title, coming at the later half of the Gilded Age and conducted by veterans reaching their “golden years.” This period produced five battlefield parks, under government management (Chickamauga-Chattanooga, Shiloh, Gettysburg, Antietam, and Vicksburg). More important, this period provided the blueprints for additional preservation. We talk of the “Gettysburg plan” vs. “Antietam plan” because of methods used. And beyond that, the blueprint incorporated plans for public use. The practical, surface use was interpretation of the battle (notably, justified as an open air classroom for military officers). Less practical, but very much at the fore, was public use for commemoration. The blueprint established – for both the means and uses – the next big period of preservation was also pushed from the federal level. And it resembled that “golden age”… except for less participation of the veterans, who were passing away by that time. Parks established from 1915 to 1938 included Richmond, Fredericksburg-Spotsylvania, Petersburg, Stones River, and Brices Cross Roads. Also in the list of fields preserved during that period are Revolutionary War sites such as Cowpens, Moore’s Creek, and Kings Mountain. Such indicates “federal directed” preservation had moved beyond the urgings of Civil War veterans to a broader goal embracing the wider context of American history. Sort of a function of the period, if I may. Though I want to steer clear of the obvious rabbit hole there, for the sake of brevity. The preservation of these major battlefields setup the Centennial of the Civil War. There were places for those observances to occur. But – and let me be clear that I cannot say this from the stance of a participant – those observances seemed confined. The Centennial period, from the perspective of preservation, comes across as entrenchment. The focus was more toward interpretation of what was in place – those wonderful, dated guidebooks and orientation movies that have only recently been updated. In terms of land, bookend achievements at Manassas and Monocacy epitomize the efforts of that era – small, timid efforts that appear, in hindsight, fraught with missed opportunities. But some of those missed opportunities setup the next period of Civil War battlefield preservation. For the first 100 years after the Civil War, major development threats to battlefields were few and far between. Remoteness insulated many fields from disruption. That changed in the 1970s as the vectors producing “sprawl” brought direct and indirect changes to these battlefields. And the “uncovered” battlefield lands were often thrown into the middle of a public discussion which pitted perceived “progress” against preservation. Typical of these episodes, Manassas battlefield faced major developments on ground which arguably should have been included in the original park’s boundaries. Another example came from Brandy Station, where preservationists contested major development projects which would have obliterated an otherwise pristine battlefield. While both of those sites may be listed as “successful,” other places, such as Chantilly and so many of the Atlanta Campaign sites, were not so. This was a contentious period for preservation, to say the least. This “contentious” period saw private individuals and advocacy groups at the fore of the dialog. In many places, the advocates for preservation came to terms with “preserve what you can” compromises. While federal and state officials were there, it was the preservation advocates doing most of the push. Instead of “top down” driven goals, what emerged were “grass roots” preservation advocates. So we see through these five periods, preservation of all that battlefield land was not governed by a single guiding strategy or movement. Rather the preservation efforts were a function of each generation’s initiative. However, at the same time we can say through all the periods, the efforts focused on the land for those two core reasons – interpretation and commemoration. Interpretation, through these periods, remained somewhat rigid for its application (in terms of how we process information, the signage of the 1890s is not far removed from the smart-phone app geo-tag of today) even while the content of the message remained fluid. On the other hand, commemoration has defied any fixed characterization over the decades, ranging from celebration to reflection to introspection. While we all approach the battlefields from the context of history, gaining perspective from the interpretation, what we carry away from them – the commemorative aspect – varies by individual. And there in lies the answer to the question. The reason we have so much Civil War battlefield space preserved is because that war was a broad, almost limitless, subject from which so much defies concrete definition. We might start the discussion around “facts” or “sources” or such. But in the end, all devolves into “opinions” based on our own perspectives. And the best place to reach any authoritative perspective is standing with both feet planted firmly on the ground. We have not, as a nation, come to terms with the Civil War after 150 years. So we should not be surprised that we have such an attachment to the ground over which it was fought. Perhaps, the country needs those acres to serve as an unhealed wound.